Long flowing locks are something many people want, but try as they may, can’t quite seem to achieve. Many people associate hair loss with age, and while that can certainly be true, there is often times more to the story. According to the Mayo Clinic, several things can lead to hair loss or slower hair growth including nutritional deficiencies, overuse of products, or even genetics. You don’t have to spend thousands of dollars to give your hair the boost it needs. Actually, the remedies we are discussing here include everyday products that most people keep in their pantry. Let’s take a look at some of the most efficient home remedies that will stimulate your hair. Warning: You may be surprised by the simplicity! Onions. Yes, onions! While it may not be the nicest smelling choice, it certainly reaps significant benefits. Onion juice proves to be effective because it consists of sulfur. Style Craze indicates that sulfur boosts collagen production which in turn leads to faster hair growth. Simply peel two onions and blend in a mixer. Once juices surface, just apply it directly to your scalp. Allow the juice to sit for 15 minutes before rinsing completely with water. Your hair thirsts for protein and eggs just so happen to be an excellent source of it. The protein found in the egg will nourish hair so that it can grow. To use, whisk two egg yolks with olive oil. Apply the mixture to your hair and allow it to sit for 30 minutes. Rinse with cold water. Green tea consists of antioxidants that prevent hair loss and fuel hair growth. All you've got to do is apply freshly brewed tea directly to your hair. Take care to cover root to tip. Allow the concoction to settle on your hair for one hour before rinsing. Looking for a better-smelling option? Rosemary not only smells terrific but also has some benefits for your hair. According to an article from Top 10 Home Remedies, not only does the antioxidants in Rosemary promote longer, stronger hair, but the sulfur and silica found in the herb can actually reverse hair loss. Simply Mmx rosemary essential oil into a couple of teaspoons of oil (coconut or olive oil are popular choices). Allow the mixture to sit on your hair for half an hour before shampooing as usual. You can also rinse your hair with rosemary water. Simply add a handful of the herb to boiling water, cool, and use it as a rinse during your regular hair routine. According to Rapid Home Remedies, apple cider vinegar can be utilized as a mild rinse for your hair. The cleansing properties promote a healthy pH balance which helps keep hair growing fast. To use, mix apple cider vinegar into 1-2 cups of water. Rinse over your hair during your regular beauty routine. It is a mild solution that can be repeated before every hair wash.
Rich in vitamins A, B and C, potatoes are the perfect choice for a natural hair growth remedy. The nutrients help with hair growth, but also keeps hair healthy and less likely to break from product damage. All you've got to do is blend a potato until juices form. Apply the juices directly to the hair and allow it to sit for 15 minutes. Rinse thoroughly with water. Many people are familiar with the soothing properties of coconut milk, but what does it do for your hair? According to Style Craze, the fatty proteins help protect the hair from breakage allowing it to grow to its fullest ability. Simply apply coconut milk over your entire scalp and hair. Allow it to sit overnight and rinse the next morning. Cayenne pepper can do more than just spice up your food. When applied to the hair, the capsaicin found in the ingredient increased blood flow to the scalp resulting in stimulated hair growth. To use, mix one teaspoon of Cayenne Pepper with two teaspoons of olive oil. Massage into the scalp and allow it to sit for 10 minutes before rinsing. Be careful to avoid contact with your eyes. Ready to give it a try? 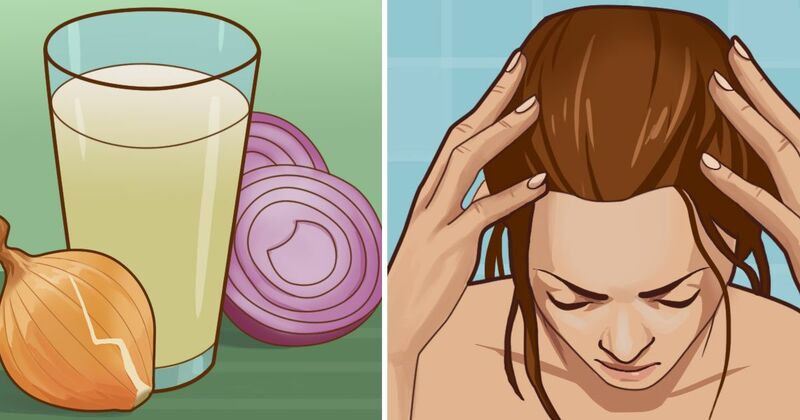 Give these home remedies a shot to get those locks growing! Don’t forget to share with friends.